Is Memorial Day Just Another Holiday ? It is the veteran, not the preacher, who has given us freedom us freedom of religion. 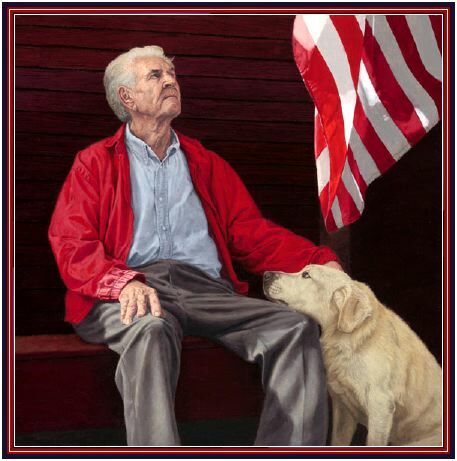 It is the veteran, not the politician, who ahs given us the right to vote. If the peoples of the earth would be won to Christianity and practice it in truth, Andy Rooney’s wish may come true. The veterans and those who now serve under the flag, show their honor and loyalty to this nation by saluting the United States flag. 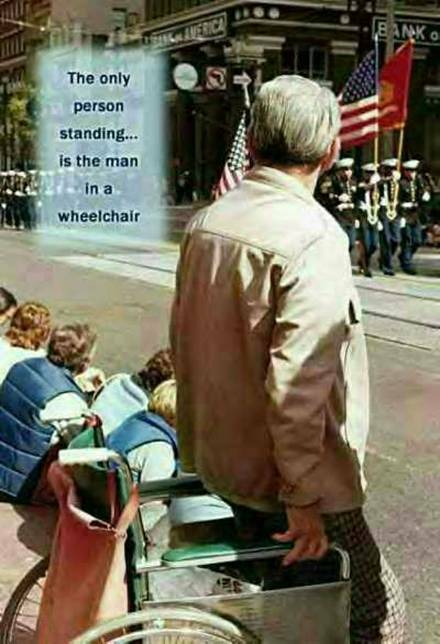 When they see the flag waving in the breeze or passing by in a parade, they know things that those of us who have never been in uniform will never know. They salute memories and causes. This Memorial Day, what will you do to salute and honor the men and women who served and lost their lives in our U.S. Army, U.S. Marine Corp, U.S. Navy, U.S. Air Force, and U.S. Coast Guard ? I also entered the Bo Carter Memorial Writing Contest this spring and the results came today. I won third place with a humorous essay entitled “Fred”. It is a true story, from my point of view, about some baby bunnies we tried to save when our children were young. It started innocently enough. Six orphaned baby bunnies from a nest turned up by the lawn mower, five normal children wanting to rescue them, one heroic father who carried them in, and one harried mother who should have seen it coming. Two of the tiny bunnies died in the first hour. Now we were scooping the others out of their shoe box incubator one at a time for pipette feeding. AMom, how come they don=t open their eyes? @ Andrea asked. AWon=t their mommy come looking for them? @ asked Rachel. ADad, what are they eating? @ Peter asked. ABaby formula,@ my husband, Chuck, answered. ASo far I can=t seem to get them to eat it. @ My husband=s eyes were as wide with wonder and his brow as wrinkled with concern as his children=s, gathered around him at the kitchen table. AMommy, don=t you like baby bunnies? @ Rachel turned her doe eyes on me. ADaddy, don=t let the bunnies die! @ Andrea wailed. How had I become the villain here? ABut, Dad……@ Michael looked stricken. ADaddy, they aren=t all hims. Some are girl bunnies,@ Andrea said, gently stroking one of them. AHow can you tell, Dad? @ Peter asked. AFor someone who was so determined not to get up for feedings, you sure look maternal,@ he chuckled. AHm. I wouldn=t worry. With our luck, we=ll nurse them back to health and they=ll hop right out and polish off the garden. Unfortunately, the two dehydrated bunnies died that evening, but fortunately for me, they died on Chuck=s watch. He took it rather hard, I=m afraid. I felt obligated to attend the back yard services he conducted as another day=s dirty dishes piled up in the sink. This was turning into quite the drama. The next morning Bunny #3 expired. Chuck was so concerned about our remaining bunny, he called home three times that afternoon to ask about him. Luckily, the week passed and Fred, officially still Bunny #4, finally opened his eyes! Friends and neighbors came by to call on Fred and to offer their educated opinions about whether he was a Fred or a Fredricka. We bought another can of formula and a larger pipette. We shot a whole roll of film of the kids giving Fred hopping lessons. They would set him down on the sun-warmed concrete and prod him to hop. Afterwards, poor Fred had to ride around in my apron pocket to recover. We added a heating pad to his shoe box, Andrea placed her stuffed bunny beside him and called it Baby Sister, and Chuck experimented with giving Fred a piece of lettuce. Then, on the morning of day twelve, it happened. Fred hopped! Out came the video camera to record the momentous occasion. Bunny #4 was christened Fred. Chuck said, AYou kids need to thank your mother. She wasn’t really in favor of this whole thing in the first place, but she spent many hours feeding bunnies and Fred wouldn=t have lived if it hadn=t been for Mom. @ It was one of those very satisfying moments in a mother=s life, the kids= arms all flung around my neck. AWhy don=t all of you put Fred into his shoe box and take him shopping? @ I suggested. AShopping for what? @ they asked. After supper, Chuck took Fred and the children to Ace Hardware while I caught up on dirty dishes. The clock chimed four a.m. on day thirteen as I flipped on the light over the kitchen sink and stuck the Pyrex bowl of formula into the microwave once again. Fred yawned as I drew him out of hjs shiny, new cage. AOkay, Fred. Make it snappy so we can both get back to bed before the sun rises.” I held Fred in my left palm and the pipette in my right hand. I drew up the milk. AOpen wide. @ Then, just as I was sliding the pipette between his lips, Fred suddenly hopped! He flew out of my hand onto the table. As I reached for him, a sickening realization dawned on me. The pipette lay broken on the table, but half of it was still in Fred=s mouth. He wasn=t moving. My hands trembled , my breath came in strangled gasps. I had killed my children=s rabbit! After all these days of valiant effort, after realizing that I loved Fred despite everything he=d put me through, he was gone. As the daylight broke, so did I. Chuck came downstairs to find me weeping over Fred=s limp little body. AWhat happened? @ he asked. I pointed to the broken pipette. Thus began my probationary sentence - six months with Butterscotch, three months of Cookie and a year of constant harassment from Houdini. That was twenty-five years ago. My children grew up without any mother-inflicted neuroses, thank God, but I am thinking of getting my grandchildren a hamster for Christmas! Three weeks ago I received the results of the A.P. Nelson Feature Article Writing Contest to which I had submitted an entry. I am delighted to find out that I won third prize and $80! The following is the essay I submitted. According to MySummerCamps.com, there are over 400 summer camps in Wisconsin. Over a dozen of these are strictly equestrian camps, but many more are regular camps with stables of horses for campers to ride under the supervision of trained wranglers. For the thousands of people like me, who have little, if any, experience with horses, these camps offer a one-of-a kind chance to learn. My five children spent a big chunk of many summers at one such camp, Fort Wilderness, a non-denominational Bible camp in McNaughton, Wisconsin. Fort Wilderness offers not only the usual summer camp activities, but they also have a horseback riding program for campers of all riding abilities. One summer, my husband and I were finally able to join our kids for a week of family camp. Although I was nervous around horses, they persuaded me to go on a family trail ride. The sun was low in the sky on that lazy, August afternoon as I followed the unmistakable odor of hay and manure to the stables. I listened to the sounds of insects buzzing and the occasional horse pawing at the dirt as I feverishly slapped at horse flies. The wranglers, dressed in Levis, cowboy boots, flannel shirts, and bandanas, were joking and whistling while they saddled a dozen trail horses tied at the hitching rails. I wondered which horse would be mine. My only previous experience with horses had been taking a few turns around a field on an old nag at the state fair when I was ten. That poor creature probably would have plodded around that rutted ring at the same speed in the same direction if Geronimo himself had been on his back! All I knew was that horses have big teeth and the cleverest way to shoo off flies by wiggling their skin. Despite my inexperience, I had agreed to a family trail ride and apprehensions be hanged, I was going to be a good sport. “Bob? @ I replied. AWhat kind of name for a horse is that? How do you expect me to mount this trusty steed here and holler AHigh ho, Bob!@? mounted up, Amake me look good and no funny stuff. @ Before I=d even picked up the reins, Bob had lumbered on over and found his customary place in line. The wrangler was right - the name fit him. ABobby@ would’ve been too playful, ARobert@ too regal, and ARob@ too macho. At turtle speed, Bob and I were off - bringing up the rear. As we plodded along a narrow trail through the pine forest, I learned a lot about Bob. First of all, Bob was much less excited about this ride than I was. Moseying along, Bob’s mind set on nothing but his beloved feed bag back at the barn, I soon gave up all but a token pull on the reins. Secondly, Bob loved a snack. All 1200 pounds of him stopped every 25 yards or so to munch on a tasty fern, hardly noticing my futile yanking of the reins. Completely oblivious to me on his back, he would wedge one of my protruding legs painfully between his flank and an unyielding tree trunk. The wrangler ahead of me looked back, chuckling. “For Bob, passing up ferns is like a chocoholic refusing free samples on a Hershey’s tour. Just give him a kick. @ Like I hadn’t tried that! Bob was persnickety too. He would veer way off the trail into the thicket in order to avoid stepping in a puddle. Without warning, I’d be forced to flatten myself in the saddle to avoid decapitation by a tree branch. And talk about skittish! Bob startled at butterflies, not to mention getting into a real dither when a toad hopped across our path. No one else was having any trouble with their horses, including my nine-year-old daughter. I had a bone to pick with that wrangler when I got back – if I got back, that is. But after awhile, Bob and I came to an understanding. He was lackadaisical, true, but very congenial. For nearly an hour, he patiently listened to me chatter about the dumbest things. When the horse in front of us suddenly stopped and began dropping “horse apples” with its “you-know-what” just inches from Bob=s nose, did Bob get upset? Not Bob! He remained gracious in this awkward social circumstance, even when the other horse swished its tail in his eye. Bob, himself a gentleman, waited to answer nature=s call until we were back at the rail and I had dismounted. He even seemed pleased to pose cheek to cheek with me for a photo. I now understood why the stables were such a popular place. From one very benign adventure on a horse, my fear of horses wasn’t erased, but I did look forward to another go. The wranglers taught safety, control, respect for the horse, as well as skills for all levels. I heartily recommend seeking out one of the many camps in Wisconsin that offer horseback riding and give it a try. Some camps, like Fort Wilderness, offer winter riding, a unique experience in Wisconsin’s snowy north woods. About a year ago, I developed a very painful inflammation of the soft tissue on the bottom of my right foot called plantar fasciitis. After hobbling around for a few weeks, I sought the advice of my orthopedic surgeon. After diagnosing the problem, he injected cortisone into the inflamed area. No results. He sent me to physical therapy where I learned stretching exercises. I did them faithfully. No results. The therapist sent me to a man who makes orthotics that fit into the shoe and supposedly supports the foot properly and helps the foot to heal. He sent me to a shoe store to get “orthopedic” shoes because none of my shoes could accommodate the orthotics. I bought two pair that were not terribly fashionable, but by this time I was willing to try anything. I wore the orthotics in my special shoes for months. No results. The man who made the orthotic suggested wearing a night splint and fitted me with one. I have trouble sleeping under the best of circumstances and wearing a night splint was not even close to the best of circumstances. I wore the splint for a month anyway. Crabby from lack of sleep, I went back to the orthopedic surgeon. He gave me another cortisone injection and told me to keep up everything else. By this time, a whole year had gone by and my foot was still so painful that I could not stand on it for more than a couple of hours. The second cortisone did nothing. This time my orthopedic doctor sent me to a foot specialist at the prestigious medical center in Marshfield, Wisconsin. He X-rayed, prodded and poked and said that the only thing left to try was to completely rest the foot. He wanted to cast it for 8 weeks, but I burst into tears over that. (Are you beginning to feel my frustration?) So he agreed that I could wear a removable splint affair called a cam walker boot. It splints the lower leg and weighs a ton. I was not to bear weight on that leg at all, but it was removable for a bath and sleep. I tried crutches, but all of the muscle problems that I would develop using crutches because of my fibromyalgia, nixed the crutches. In order to get around with this thing for 8 weeks, I was given a sort of scooter with a pad to rest my bent knee and boot on while pushing myself around with my good leg. As much as I wanted to cheat, I have not, because this is the last resort treatment and I want it to be successful. After discovering that the scooter exhausted me, we got a wheelchair. This is week five of the 8 weeks and it is all getting really old. I have had pain in my shoulders and lower arms, my right hip, and both knees from the awkward ways I must do things. I have developed a very attractive callus on my right knee from crawling around (not to mention the complete loss of dignity from crawling in front of all my company!). By the end of the day, both of my ankles have swollen to HUGE and the doctor says, “You’ll have to keep your feet up.” Yeah, right. There are dings in the woodwork all over my house from the scooter and the wheelchair. Because the scooter does not negotiate corners or tight turns, I have fallen twice, resulting in some nasty bruises. I have to crawl on my hands and knees up and down the stairs and around the upstairs. It seems like EVERYTHING takes twice as long to do or I can’t do it at all. (Can you sense my frustration and exhaustion?) I have felt so guilty about my poor husband having to do so much for me on top of his regular work schedule. Then we had all of the kids and my parents here for nearly 2 weeks. You can imagine the cooking, dishes, laundry and outings (which required my chauffeurs to fold up the wheelchair or scooter each time we went somewhere and then fold it back up again for the trip home). On Tuesday, I wanted to plant flowers on my patio. We drove to two nurseries and purchased the flowers, like I have done for years. When we got home, Chuck pushed me in my wheelchair to the patio, where we could weed, turn up the soil and plant. I tried so hard to reach down and help but I just couldn’t reach. My wheelchair kept getting caught on the garden hose that always seemed to be between me and the flats of flowers or the pots I wanted to plant in next. I would point to where I wanted Chuck to plant something, but he didn’t understand me half the time and was plating things in the wrong places. Suddenly, I lost it. I yelled at Chuck! I yelled nasty things not really meant for him, but for all the frustrating situations I’d been facing. Nevertheless, the look on my dear husband’s face was devastating. Instantly, I knew I had to stop what we were doing and apologize. I had to thank him and hug him and cry a little. Then I had to go to God and cry it all out once more. God spoke to me about how little frustrations can build up without us realizing it. He showed me a picture of an oyster. Most of us can take a lesson from the oyster. The oyster gets irritations inside his shell. He does not like them; he tries to get rid of them. The most extraordinary thing is that as he does, the sand in his shell begins to change. Unable to get rid of the irritations, the oyster settles down to make of them a pearl. If there are irritations in our lives today, some seriously interfering with life, some momentary, there is a prescription that, like me, you may not have thought of - make a pearl. It may be a pearl of patience (note to self!). It may take love and faith to do it, but a pearl is so much better than a nasty outburst, anger, or ungratefulness. Please pray for me as I work out this irritation and try to make a pearl. Please pray that my foot heals too. On the bright side, I only have three more weeks to go. This Sunday is my thirty fifth Mother’s Day. During those thirty five years, I’ve mothered five children, seven dogs, three hamsters, four baby bunnies (one of which I accidentally did in), five goldfish, and an orphaned baby squirrel. I have nursed, cooked, bathed, diapered, wiped, chased, sewed, vacuumed, sung, carted, rocked, baked, shopped, bench-warmed, raffled, taught, read, encouraged, nagged, and bribed my brood. I have survived their mastery of the flute, trombone, baritone, piano, and voice (OK, the trombone and baritone never made it past junior high - but two of the five children went on to be music majors ) I have re-learned the geography of Africa twice, made puppets and costumes, cheered, chaperoned, took photographs ad nauseum, learned to use a video recorder, counseled, lectured, scolded, waited up, listened, and dried tears. I have waited in doctors’, dentists’, orthodontists’, principals’, college admissions’, and DMV offices. I have traveled to Italy, Russia, Hungary, and Bulgaria to see the cultures my children were so in love with. I’ve learned to use a computer - it was either learn to email or never hear from the kids at all - and now it’s Facebook and Skype! I’ve scrounged up six rummage sale televisions, assorted couches, futons, tables, lamps, etc. to furnish “first” apartments (that are always third floor attics), watched my sons and daughters graduate and move away to all parts of the world, and have made the journey through two weddings, with a third coming this fall, which will make me a mother of nine! Soon there will be five PhDs to celebrate (but, thankfully, not pay for), and I have become Grandma to the two cutest kids in the world. What an adventure! Sitting down to read what I just wrote takes my breath away. Thirty six years. For all of that, shouldn’t there be some sort of amazing reward? Some celebration akin to say, a coronation or a wedding (which the kids are now having, with brand new, state of the art gifts, while we limp along with a one slot toaster that chars bagels)? Alas, no. There are rewards, however. The first of several rewards mothers get to look forward to as the children leave the nest, is called MENOPAUSE, which, thank goodness, is but a frightening memory to me now. In theory, menopause is simple, really. It is the time when a woman’s body no longer has anything left to physically produce for posterity and she is perfectly happy to stop being crabby, crampy, and oozy for 10 days every month. In theory, one day she will wake up and it will be all over, the Kotex will be willed to her daughters, and she will be free. Wrong. Hormones don’t work that way. They wind down slowly- very slowly-agonizingly slowly. The female’s handbook has a separate chapter for pre-menopause, peri-menopause, menopause, and post-menopause (because evidently even when it’s over, it’s not over) . Those hormones go out swinging. Hot flashes, for example- those sensations of putting your face into a 400 degree oven- come over you without warning. There are night sweats that wake you up in soaked sheets and pajamas, mood swings, that make you wonder if you have been cursed to relive the 8th grade, and surprise periods that show one month, lay low for four, then make a SURPRISE appearance just when you have no tampons in the house or are wearing white, wool pants. They all work together to make gray hair, wrinkles, and bifocals seem like a walk in the park. among a few million other things. Of course, now that the baby boomers are going through menopause, you’d think it was the first time any woman had ever had the experience. Advice, both good and bad, is coming out of the woodwork.. Like anything else in the realm of “female things”, there are plenty of other women around who are anxious to dispense their wisdom on the subject. There are the suave athletics, who tell you how they breezed through menopause, hardly realizing it had happened. (”It’s completely natural, you know.”) They’re the same ones who had an hour long labor with no drugs and walked straight home from the delivery room with their baby securely suckling at the breast. Then there are the au naturale, who give you a list of herbs to swallow, drink, douche, and rub on . They also want you to give up eating anything you can’t buy at the health food store and meditate for the week before your period is due (whenever that is, since it hasn’t been regular for 2 years now).Your mother is no help. She had a hysterectomy. When you consult your Aunt Mabel, she says she had migraine headaches for 7 years during “the change” and when you ask her what she did for relief, she says she put an ice pack on her head and smoked a pack and a half of Camels! for osteoporosis and, by the way, he was retiring next month. When I thanked him for our 25 years together, he replied, “If there’s one thing I know from 35 years of obstetrics it’s that I’m sure glad I’m not a woman! Now, don’t forget to stop by radiology and schedule your mammogram and colonoscopy.” What a generous parting gift, the “waffle iron” and a gallon of lemon-flavored dishwater to drink! I don’t remember a chapter on these in the handbook! The second reward you can look forward to, ladies, is bifocals. It’s bad enough that you can no longer casually pick up the printed page and read it, but suddenly you notice that every appliance and battery-operated device you own, has microscopic print. No longer can you read the buttons on your cell phone, camera, coffee maker, and wristwatch, but you cannot read the synopsis on the back of the DVDs at Blockbuster, the nutrition labels at the grocery store, the instructions on your medicine bottles, or the labels on one single cosmetic or hair product in your bathroom! What you do get to do is invest in “readers”. Since you will refuse to walk around like your high school guidance counselor by wearing glasses on a chain around your neck, you will need dozens of them. I have a pair in each car, one by each phone, at my desk, my sewing machine, in the bathroom, at the kitchen table, by the DVD player, in my purse, and anywhere else I might possibly need to read some devilishly small print. In addition to that, I have sunglasses that fit my array of readers, in case I must read something outside! Don’t worry. Thanks to the AARP, these handy readers are even available in the dollar store! The third reward doesn’t sound so bad, really. You get the opportunity to buy new shoes! However, these won’t be platform sandals, red stilettos, cute little flip flops, or dramatic leather dress boots. On your way home from the foot doctor, who has scolded you for torturing your feet by wearing the aforementioned footwear, you will be stopping to be fitted for orthotics, then moving on to the orthopedic shoe store. There you will pay $200 for one pair of orthotic-friendly tie shoes and another $150 for one pair of Mary Janes with half inch heels, both in the exciting color selection of beige, black, or brown. You will be grateful for this too, because your bunions, hammer toes, weak ankles, or plantar fascitis will be getting some much-needed relief. The list goes on. Whereas now mall shopping is quicker, since three quarters of the stores are for teens anyway, it is not more economic. Extra support bras, support stockings, anti-aging cosmetics, and “Not-Your-Daughter’s-Jeans” constitute a high-end niche retailers have mined, raking in hard-earned baby boomer dollars. Don’t even get me started on the mother-of-the- bride/groom dress industry. After that horrible beige, lace, mother of the groom dress has gone off to live happily at Goodwill, mothers can look forward to the countless places cashing in on the “Boomers ” who are about to become grandmothers. I admit the fashionable maternity clothes our daughters wear now make the tent tops we wore look like slipcovers, but have you noticed all the new “must-haves” in baby equipment out there? A trip to Babies R Us costs more than it did to furnish our last new home. I know that we’ve driven cars with fewer frills than the Cadillac strollers you can buy! I thought I could save the kids some money by giving them the baby equipment we had carefully packed in our basement, but my expectant children informed me that the baby things I had lovingly cared for them in, are now considered baby-killers! I confess I cried as the crib my children comfortably slept in (on their tummies), as did their father before them, their uncle and his two children, their grandfather, and great-grandfather, was carried off to the crib graveyard at the dump (along with the high chair and playpen). Then I went out to buy a Pack `n Play. At least I got to put out the Fischer Price toys I had kept - as long as they were scrubbed and bleached properly. I noticed our old Candyland game, purchased in 1976 for $4.95, was looking a bit ragged, so I decided to shop for its replacement. Candyland was now $14.95 - on sale! Speaking as one who has grown old trying to finish a game of Candyland,(and finally cheated to put myself out of misery) , it ain’t worth $14.95! I duct taped the old one back together. From my experience, you will need to begin saving for grandparenthood before you reach 35, that is assuming you’ve started your kids’ college fund within a week of returning from your honeymoon. Looking back at my first Mother’s Day, I could not have known then how rewarding motherhood would be. This weekend my children and grandchildren will be coming home from all over the country to celebrate my thirty fifth Mother’s Day, the best reward of all. In my extra support bra and “not-my-daughter’s-jeans, I’ll look too young to be a grandmother. Wearing my readers, I’ll be able to play Candyland and read my Mother’s Day cards. Wearing my orthopedic shoes, I’ll be able to push my grandson in his Cadillac stroller as far as he wants to go. And I will have a special treat. My parents are coming too. I just hope my mother doesn’t tell me what I have to look forward to on the way to great-grandmotherhood! I must apologize for all of the mistakes in last week’s D-mail! I went back to re-read it and couldn’t believe it! I guess I was too tired (or lazy) to proof read it enough. If you wish to read the polished version, go to my blog at www.cathyconger.com and find the headline, D-mail for the Week of April 22, 2010. I promised that Part II would be quite short. I hope you didn’t just get bogged down reading my Growth Chart and were too tired to even think about creating your own. Perhaps the things I wrote reminded you of things you experienced along the road. When my first two children were toddlers, I was asked to create a program for the county to educate single, pregnant teens in not only childbirth techniques but also parenting and counseling. I was a Lamaze childbirth instructor at the time and had a heart for the teens who, at that time, had to drop out of school when they began to “show” and lost out on their education, not to mention received little childbirth education. I took this project on with gusto. It took a lot of time and energy, but it was very fulfilling. One afternoon I came home after taking my fabulous babysitter, Marcia, home, and began to fix dinner. I had just found out that I was pregnant again and I was anxious to lay down and rest. My daughter toddled over to me and held up her hands to be picked up and she said, “Up, Marcia.Up.” She called me Marcia. I picked her up and hugged her, all the while sobbing as if my heart would break. When I told my husband later that night, he said, “I think you know what you need to do.” I needed to pass the project on so I could be a mother to my own children. However, I didn’t see how I was going to find someone to take over for me. Nevertheless, I told God I was willing and, just like that, he provided. A new obstetrician had just moved to town. His wife had been doing just what I had with teens where they had lived before. She was anxious to work on such a project as mine and I gladly handed over the reins to her. Was the pregnant teen project a good thing to do? Absolutely! Was it the best thing for me to be spending my personal resources on at that time? No, it was not. Staying home with my children trumped it so God provided someone to take over. I want women to grow in experience and intellect. I want to encourage those who feel like their brain has turned to mush that they will find lots of opportunities to learn, create, and contribute if they look around and pray for guidance. There will be little ways that add up. I read in the bathroom - always have. In that 5-10 minutes answering nature’s call, I get 2 news magazines and a writing magazine read in a week! I knit or stitch while watching TV or on car trips. I try to get away by myself for two enrichment activities or conferences a year, something my husband thought was important enough, that he would arrange the babysitting (which, believe it or not, one day is no longer an obstacle) so I could go. For older women, I encourage you to avoid the extremes. Once you have fewer responsibilities at home, you may be tempted to jump into too many of the abundant opportunities that are out there. That’s one extreme. The other is getting set in your ways and not pursuing new activities that sharpen your brain, grow your faith, and keep your body strong. Us older gals can burn out too, or worse, become couch potatoes. If you haven’t found the time to make your own growth chart, at least think about it. Keep a piece of paper on the refrigerator to jot down ideas when they come to you. What are you gifted at? What are time-wasters? What do you dream of doing before you die? Is this the time to drop a time-waster and realize one of your dreams? What is God calling you to do? The Dead Sea scrolls were discovered in 1947 in a desolate area of the new nation of Israel called Qumran. They were accidentally discovered by Bedouins in a cave near the Dead Sea. Inside the cave they found a trail of broken pottery which they followed back into the cave. There they came across several pottery jars, inside of which they found rolled up scrolls. The scrolls were made of animal skins and had been preserved by the desert conditions. Realizing that they had uncovered something valuable, the Bedouins took the scrolls to Jerusalem to sell. Little did they know they had uncovered the most valuable find of the twentieth century. The “fence” that bought the scrolls, a man named Kando, took them to several professors of ancient antiquities in Jerusalem, who recognized the writing as ancient Hebrew. Not only ancient Hebrew, but books of the Old Testament, including a long scroll containing the words of Isaiah! Later discoveries were found to be written in Greek as well. At that time the new country of Israel was at war with the Arabs and no one had the time nor money to begin a search for more jars in the desert. The scrolls were moved to Beirut for safe-keeping. But by 1952, archeologists had set up camp in Qumran and were excavating the area, discovering many more jars of scrolls plus evidence of a settlement from the time of Christ. This settlement turned out to be the home of a monastic sect of the time known as the Essenes. No one knows for sure, but it is believed that the scrolls were painstakingly hand-written by these monks and carefully stored in clay jars in the mountain caves to preserve them. As the scrolls have been dated to the first century AD, it is also very possible that these monks were copying the scriptures to preserve them from the Romans, who sacked the city of Jerusalem in 66 AD and fought and defeated the last remnant of the Jewish rebels at Masada in 73 AD, which is not far from Qumran. After the Six Day War, the scrolls were returned to Israel and further excavation revealed 11 more caves containing scrolls. Unfortunately, after over 2000 years in these caves, the scrolls were brittle and many disintegrated in the hands of the archeologists. However, after years of piecing the tiny fragments together in a temperature/humidity- controlled lab, the amazing result was book after book of the Old Testament, all but the book of Esther.. Using the oldest complete scriptures to compare the scrolls with, linguists were able to fill in the missing words. The Dead Sea scrolls contain writings in three categories, books from the Old Testament, the rules and everyday routines of the Essene community, and single books, some of which are found in the apochrophal writings. They believe that there are probably more scrolls in more caves and scientists are still searching in Qumran. The scrolls that have been catalogued so far are kept in Jerusalem and some in France (one of the major archeologists to work on this project, Roland de Vaux, was French). allows a discovery like the Dead Sea scrolls to rebuild faith in His holy writings. God be praised! His Word endures! The Dead Sea scrolls , containing the Hebrew scriptures of the Old Testament, are not just of great value to Christians, but also to Jews and Muslims, who worship the God of Abraham, Isaac, Jacob, and Moses. The significance of the scrolls relates in a large part to the field of textual criticism and how accurately the Bible has been transcribed over time. Before the discovery of the Dead Sea Scrolls, the oldest Hebrew manuscripts of the Bible were Masoretic texts dating to 10th century AD. The biblical manuscripts found among the Dead Sea Scrolls push that date back a millennium to the 2nd century BC. Before this discovery, the earliest extant manuscripts of the Old Testament were in Greek. The exhibit also contained copies of the many translations of the Bible, from a very old Bible, written by hand in Latin by Catholic monks during the Dark Ages to the Gutenburg Bible, the oldest Bible printed on a press to Martin Luther’s Bible translation in German, a King James Bible from the early 1700s and Bibles carried by soldiers during both World wars. Also, the last part of the exhibit explained that, at this time, specially chosen calligraphers and artists, are working on a project sponsored by St. John’s University in Collegeville, Minnesota, the purpose of which is to complete a Bible by duplicating how monks a thousand years ago hand-wrote the Bible. They are using the same type of paper, pen, and ink used by the monks to laboriously copy the scriptures. Artists are also creating the pictures in this Bible using gold and colored inks that the monks used long ago. The exhibit said that they should be finished in the next year. I wonder how many hours it will end up taking? Yesterday the museum exhibit was crowded with people of all ages, many school children who probably had never heard about the scrolls. I hope those of you in Wisconsin will be able to make the trip to Milwaukee to see the exhibit. It runs until June 9th. I hope that the rest of you reading this will have the chance to see the exhibit if and when it comes to your area.